Any skill that includes risk requires education and practice. You wouldn’t get behind the wheel without learning to drive and you shouldn’t jump into the market without learning how to trade either. With our Trading Simulator you have a safe starting point. You can try every technique and experiment and there is no way to lose anything. Instead, your simulated positions get tracked in real time. Remember, even though you are not using real money to trade on the simulator, you are indeed trading on real live data without any lag. You are testing yourself on the real market. Finally, don’t forget that any trading activity needs to be assessed and saved. Part of learning to trade is analyzing what you have done right and wrong - all this will help you get accustomed to the pressure of live trading. Our Trading Simulator was built to teach you how to trade Futures and Forex. It’s a perfect environment to master your trading skills without risking your own funds. It runs on a real time market price feed, so while you may be playing with demo money, you’re still trading on the real market. The Trading Simulator comes programmed with default layouts that are useful for any new trader, and is customizable to any trader’s needs. Practice, learn the different functions and customize our recommended trading platform to your taste. When you are comfortable, take the step and start trading live. Our Trading Simulator is built for the beginner. The platform has detailed tooltips to show you how to operate so you can never get lost during your trading. The Trading Simulator can be changed to fit your preferences. From color scheme to scaling your charts and other widgets, the platform is built to meet your needs. While other companies use a looped feed that gives you dummy information, our simulator provides you a live feed with real quotes that shows you the market as it truly is. The multiple widgets and sidebar feature offered on the Trading Simulator enables you to keep your focus on one screen, where it’s needed most. 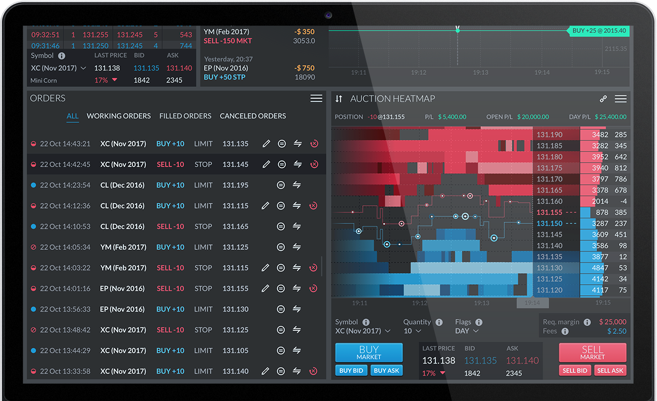 The Trading Simulator is based on the Finamark Platform, a technologically advanced platform with a sleek design. Live customer support over the phone and through our chatbar will help you get in touch with all the people who know how to clear up any confusion.